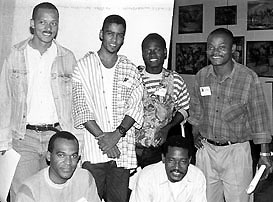 African nations at the 1996 Chess Olympiad!! These pictures were taken by Jerome Bibuld, International Arbiter and Chess Photographer extraordinaire. Those interested in his photos anywhere on this site should contact him for use privileges. 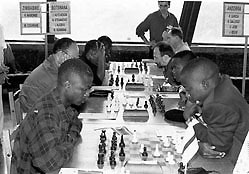 The Angola Chess Federation has enjoyed perhaps the most success among Sub-Saharan African nations. The country has been wracked by an ongoing civil war, but that has not prevented the country from producing five International Masters. 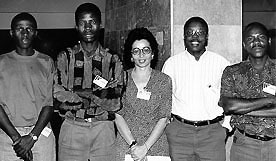 Pictured in above picture are: kneeling - IM Alexandre Nacsimento, IM Manuel Mateus; standing - IM Armindo Sousa, IM Pedro Aderito, IM Eugenio Campos, Ludy Sousa. Picture above is Zimbabwe taking on Botswana (neighboring countries). This match was won convincingly by Zimbabwe in a 4-0 drubbing. Zimbabwe ended up with 24½ while Botswana scored 24. Russia, led by GMs Garry Kasparov and Vladimir Kramnik, won the Gold with 38½. Zimbabwe was led by IM Kudzunai Mamombe on Board 1 and has since produced a young star in IM Robert Gwaze, former African Junior Champion. Botswana also has a young star, Ignatius Njobvu, shown in this picture playing Board 3 for the Botswana side. 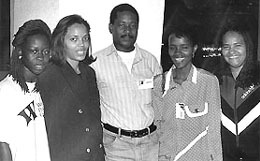 IM Jesus Hernandez-Ruiz of Cuba (L) captains the Seychelles women's team. 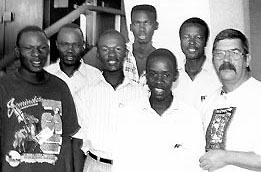 Members of the Mozambican men's team with the President of the Mozambican Chess Federation, Lucinda Cruz. 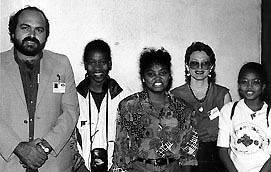 The Angolan women's team flanking IM Manuel Mateus (captain).